The development of the internal market has completely altered the regulatory environment in which European firms operate. But how has this phenomenon affected the regulators themselves? 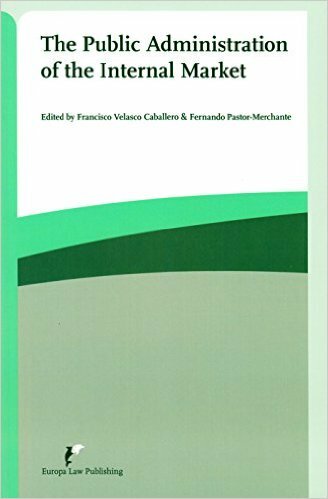 This is the question that we address in the book Francisco Velasco Caballero and Fernando Pastor Merchante (eds. ), The Public Administration of the Internal Market (Groningen: Europa Law Publishing, 2015). Our book was borne out of the observation of a certain gap in the legal literature on the European internal market, which has traditionally focused on substantive issues – such as the content and the scope of the rules on free movement – and on their impact on the allocation of powers between the European institutions and Member States. Little attention has been devoted to the way in which these rules shape the administrative institutions in charge of securing the internal market. In order to explore this issue, the book builds on the notion of ‘European administrative union’ and, hence, on an understanding of the European administration as a sum of institutions, bodies or agencies – both European and national – which act cooperatively. It is against this complex reality that the different chapters of the book scrutinize the organizational and procedural specificities of the different public administrations that interact in the internal market. The book undertakes this endeavor from three different perspectives. The idea in chapters II, III, IV and V is to explore some of the key administrative developments brought about by each of the four fundamental freedoms that support the internal market. These chapters bring to light the intense connections that link the public administrations acting within the framework of the four fundamental freedoms, be it through information-exchange or through mutual-recognition mechanisms. Juan Antonio Chinchilla Peinado focuses on food regulation as a case study of the ‘cooperative mechanisms’ created to facilitate and supervise the free movement of goods. His study shows that both the system of risk management and of administrative authorizations in this area rest on a complex mechanism of horizontal cooperation, which assigns coordination functions to the Commission or to EU agencies. Jorge Agudo González tackles the same issue in relation to the free movement of workers. The cooperative system that he depicts is markedly horizontal, one where transnational administrative acts play a prominent role. Mónica Domínguez Martín examines the impact that the free movement of services – and, in particular, the Services Directive – has had on administrative controls within the internal market. She shows that the interaction between the public administrations involved in this domain also follows cooperative patterns, yet with a very limited role for the Commission. Finally, Federico Steinberg traces the journey of the EU institutions towards the European banking union, pinpointing some of the institutional problems raised by the free movement of capital – and, more specifically, by the monetary union. This turns out to the be the only area where the coordinative role of the European Central Bank matches the horizontal cooperative design of the administrative union. The perspective changes in Chapters VI, VII and VIII. These chapters examine some of administrative innovations fostered by three policies that can be thought of as ‘adjacent’ to the core freedoms of the internal market: competition law, State aid law and public procurement. Julia Ortega Bernardo scrutinizes the administrative network that ensures the enforcement of the European rules on competition, which is probably the area in which the various procedural interconnections between the Member States and the Commission are more developed. Fernando Pastor-Merchante examines some of the administrative challenges raised by the enforcement of the rules on State aid – and some of the administrative solutions devised to address them. Finally, Silvia Díez Sastre explores the impact that the European rules on public procurement have on the institutional structures of the national administrations targeted by these rules. Granted, EU public procurement legislation has not set up any kind of administrative network. However, its focus on non-discriminatory bidding has brought about an intense transformation of certain administrative schemes. The focus shifts again in Chapters IX, X and IX, from the sector-specific approach of the preceding chapters to a more transversal approach that examines various administrative topics that cut across sectors. César Martínez Sánchez reflects on the constraints that EU law places on the taxation powers of Member States. Francisco Velasco Caballero looks at the configuration of independent regulatory agencies within the internal market. His study highlights the propensity of EU law to create European regulatory agencies in which both EU institutions and national independent regulatory agencies are represented, with the goal of providing for a homogenous regulation of their respective markets. Finally, Jorge Agudo González wraps up the book with an attempt to draw a typology of the different types of cooperative administrations that coexist within the internal market. All these chapters are preceded by a brief economic introduction to the internal market written by Asunción López and José María Mella.